Fifth grade students and parents enjoyed an interactive Shiur B’Neviim, which celebrated the transition from the formal study of Humash (The Five Books of Moses) to studying Neviim (The Prophets). Together they analyzed text from Chapter 1 of Joshua, discussed the challenges that Joshua faced replacing Moses as leader of a new nation, wrote journal entries from his perspective, and created maps showing how the land was to be divided amongst the twelve tribes. 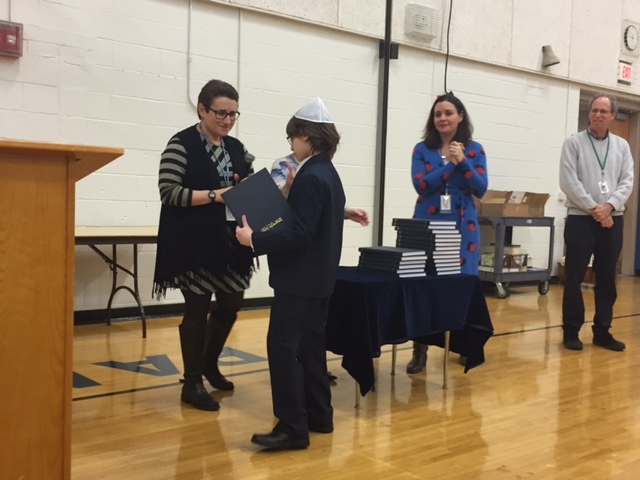 To conclude the program, the children each received their own tikkun, a book used to prepare for Torah reading, as a gift from the school in memory of Deborah Kaplan Phillips (z”l), whose three children are Schechter alumni and whose grandchildren currently attend the school. What makes this gift even more meaningful is that Schechter fifth graders learn how to chant from the Torah as part of their tefillah study.